Engines roaring, tyres screeching, the brightly-coloured racing cars swept round the tortuous curve and into the final straight. Then, with the chequered flag poised for the winner. Car number 18 streaked ahead of its rival to take Karl Manester to triumph. 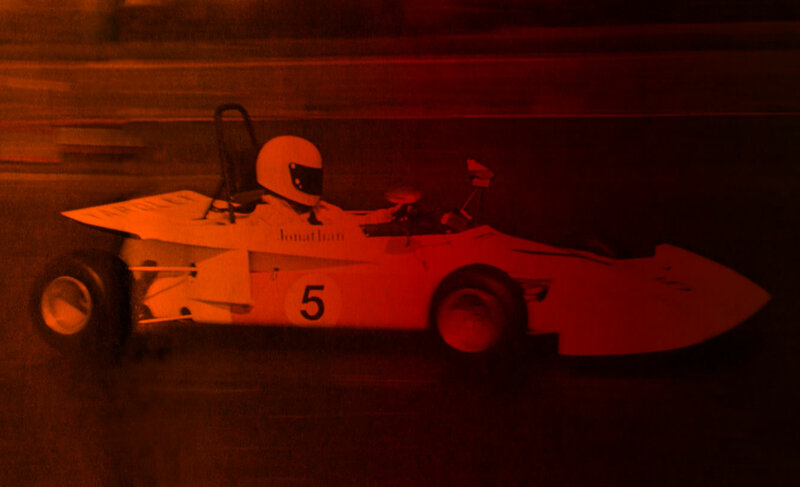 There was just one difference in this Grand Prix… the oldest driver was only 10 years old! It was the Tiny Tots Grand Prix, and it could be a taste of things to come. For the beautifully-made racing cars - magnificent replicas of real-life Formula One racers - are currently in production at a British factory and causing a great deal of international interest. And what makes the Mighty Microbe, as they are called, so eye-catching is that they are not mere soapbox or pedal-driven toys. They are powered by 148cc petrol engines and give a top speed of 30mph. Obviously, they can't be taken out on the open road. But they're just the thing for an adventure-loving boy to take round a small, private track - like the one near Aldershot where the junior grand prix, believed to be the world's first was staged. Winner, Karl, completed the 15-mile race at an average speed of 25mph, just pipping his rival to the flag. But then he did have an advantage over the others - his father happens to be the head of the engineering firm that makes the kiddy-racers. The cars are actually the brainchild of 33-year-old Mr.James Rose, of Doilis Drive, Farnham Hants, who has previously worked for the Lotus company on chassis development, and for Fords of America. He first got the idea a few years ago - just before the birth of his son. Taking a chance that his wife was going to have a boy, he decided to go ahead and build him a minature powered racing car. The news quickly got out and almost before Mr.Rose knew it, he had been talked round into designing something pretty similar on a commercial basis. Will the cars really catch on ? At almost £400 a time and with parents surely having kittens at the thought of their six to 14-year-olds careering along at 30mph, the odds would appear to be against it. But not so. The firm's order book is already in a healthy state… and the management are expecting a huge response from the United States, Sweden and West Germany. 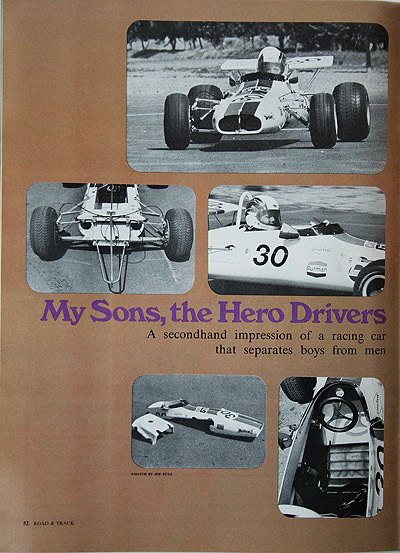 A secondhand impression of a racing car that separates boys from men. All their lives my sons have been subject to the restrictions of age and size. They've been going to the races since they could walk but always in the capacity of support troops. The front lines have been denied them, while normal trackside conversation is along the lines of "Hand me my helmet," or "See if you can reach down down there between the exhaust pipes and check that connection," and "Let me tell you what it's like out there." All normal, and nothing any growing boy doesn't suffer. Nor have they complained about it, although I know there have been times when they fervently wished growing up didn't take so long. Imagine their surprise and pleasure then, when there arose a set of circumstances making it very advantageous to be a 10 or 12 year-old boy. Advantage, nothing. Suddenly. For this occasion, it was mandatory to be a growing boy. At last they were behind the wheel, and I was on the outside looking in, fetching helmets, tightening connections and being told what it was like out there. They did not, as you'd guess, require much persuasion. The object of their cooperation is a growing boy's dream come true. 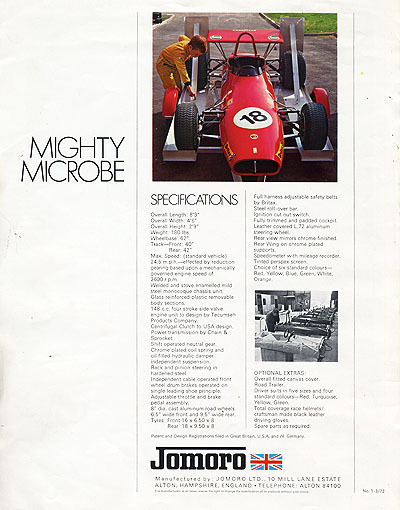 Named the Mighty Microbe, it's a single-seat racing car, authentic from fiberglass nose to fat rear tires, but built to dimensions that preclude adult use. Unlike, say, electric trains, the Mighty Microbe is not a toy for boys of all ages. Boys from 13 to 33 won't fit. The Microbe really doesn't deserve to be called a toy, a term which automatically carries an undeserved derogation. For one thing, it has a racing heritage. The maker is Jomoro Ltd., an English design firm organized by three men who worked together at Alan Mann Racing and left to do projects like preparing Capris for endurance racing and installing Rover V-8s in Rover 2000 sedans, (the last being done at British Leyland's request). He designers thus are more familiar with racing cars than with child's play. The design shows it. The basic structure is what is known in GP as a monocoque, a half-shell of stressed mild steel panels for sides and bottom, with bulkheads at front, middle and back. The tub, so to speak, extends past the driver's compartment and carries the rear suspension, unlike most GP cars now, but that only means the chassis is authentically out of date. The front body section; cockpit top and nose, and the engine cover (another item now omitted from Formula 1 cars) are fiberglass, easily detached. Suspension is fully independent, via A-arms controlled by coil spring/tube shock units. Steering is rack and pinion. This attention to detail carries on to the wing above the engine, the tiny steering wheel with padded rim, the toggle ignition switch, a gated gearshift control, rubber boots over the drive shafts as they emerge from the body, a tinted Perspex windscreen, two rear view mirrors, 4-point safety harness, snap-in padding for the seat (formed as part of the body) right down to decals from various firms which Support the Sport. The actual mechanisms, suspension aside, are not scaled down racing car. The engine is an industrial unit, 148 cc in displacement and governed to 3.6 bhp at 3500 rpm. It starts with a pull on a rope. And it drives a chain to a sprocket on a live axle which drive the rear wheels. The brakes are drum, small enough to fit inside the wheels, and they are on the front only, controlled by cables. The only instrument is a combined speedometer/engine hour meter. There's a switch for the ignition, and the gated gearshift has but two positions, forward and neutral. The last isn't strictly necessary. Since the engine has a centrifugal clutch. The car doesn't move until the revs are up. But the neutral does reduce drag so it's welcomed by the man (guess who) pulling the rope. The proportions of the Microbe are nearly perfect. The actual measurement, i.e. Wheelbase, length, track, track, height, etc., are naturally less than on the genuine article but because everything is reduced in scale there is no clue to size. Size, though, is of prime importance. Jomoro is making Microbes in England and considering exporting them to the U.S. Ron Manester, one of the partners, brought an example to Los Angeles, for display in Auto Expo. Being in the neighborhood. Manester brought it to the R&T office, so we could see it and give our informed opinions. An informed firsthand opinion from the R&T staff was plainly impossible. Being in perfect proportion, the Microbe cannot accommodate a body longer than 5 ft. 3 in. None of the daily testers are that short. My two eldest sons, though, were perfect. The 10-year-old is 4 ft. 3 in. tall, and the 12-year-old is an even 5 ft., so they span the intended range. Manester had a helmet for the younger boy, and the older one went next door and borrowed a Bell Star from his pal's mother. (She rides dirt bikes. We live ia an unusual neighborhood). Neither boy needed much instruction. Both have karting experience and the Microbe's controls are like a kart, left foot for brake, right for throttle. The only difference was the gear selector and that was mastered quicker than it takes to tell. The big boy was right at the outside limit for size. The Microbe's only adjustment is a variable pedal bar, which can be moved back and forth along a series of mounting holes in the front of the tub. With the pedals at their farthest, he could straighten his legs and sit flat in the seat. His head, though, was several inches above the roll bar. Not a safety problem, Manester said, as the builders have done every known dumb trick without managing to put the car on its head, but it did detract from the aura of Real Racing Car. To him, it didn't matter. Dad yanked on the rope, the motor burst–actually chattered would be a better word, but a little poetry never hurts– into life, he snicked it into gear and motored onto the skid pad. His instructions were to go as fast as felt comfortable. I suppose he did. Within three laps he had his right foot to the floor and was circling happily at the car's maximum speed, a touch of oversteer most of the time, a trace of opposite lock when bumps put the tail out. From the sidelines all you saw was a Bell Star filled with smile. Then he veered off the pad and whizzed past us onto the parking lot, a large rectangle with trees in the middle, making it sort of an oval with square turns. Never lifted his foot. He just bent the car into the corners, scrubbed off speed with the front tires, caught the tail at the apex and came onto the straights at full chat. When I said he drives karts I should have added that he drives them very well. After a few laps of this foolishness, I leaped into his path, waving my arms. He stopped, barley in time. Those small front brakes aren't very effective. The younger boy has less experience and less bravado. It took him 10 turns around the pad before working up to full speed. Of course he had tp pull the same stunt with the parking lot. He did use the brakes on the turns, though, so he knew better how weak they were and when flagged him down he stopped well short. Okay, time for pictures, for which the photographer had brought some fetching young things to pose as crew members and fans. We're gonna go down to the timing tower, I said. Keen, number two son said, and while I was explaining that we would amble there together, because of the traffic, he dropped the car into gear and went popping away, around the pad, into the hot car staging area and down the pit road, nipping smartly between the various crews at work there. It must have been uncanny. Being short, he sat with head below the roll bar. Front or back, the Microbe looked to be a standard racing car, especially with nothing nearby to serve as scale. What the crew thought, they didn't say. When I came panting past they were still staring after the car, mouths agape. So much for the test. We have no official figures, sorry. 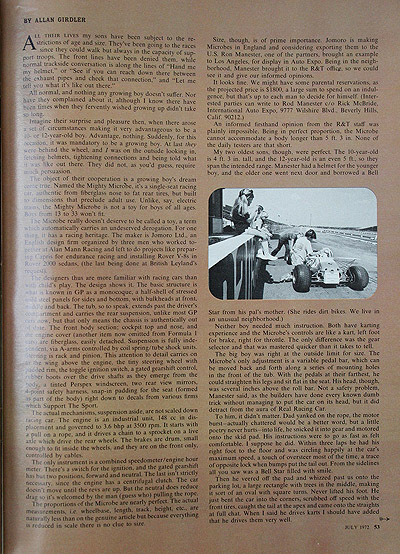 There were drag cars, enduro karts and motorcycles being run there that day, and the track officials weren't willing to allow any unlicensed 10-year-olds to run through the timing lights. Subjectively, what the testers said was "Far out!" "Bosso!" "Too much" and other expressions which they assure me signify unequivocal approval. It's fun to drive, easy to drive and when can we get one , Dad? Keep saving for a kart, I said. If I am to be relegated to the role of team manager and helmet holder, I am going to insist on drivers who don't go all out until I tell them to. The dreams of youth for glory at the wheel of a low-slung, fast-handling, hard-charging racing machine are dreams no more, the "Mighty Microbe" has arrived. The worlds first mini-car copied with superb workmanship and great authenticity from the Formula 1 cars of the international Grand Prix circuit, the "Mighty Microbe" performs as realistically as it looks. Powered by an Italian made, rear-mounted four-stroke engine of 148cc, the "Mighty Microbe" boasts coil spring and hydraulic damper independent suspension along with rack and pinion steering and full monocoque chassis design. At 3600 RPM, the car cruises at just a shade under 30 mph–a level that may be maintained for safety by mechanical governor. With the governor removed, much higher speeds are possible. The Mighty Microbe comes by its pur sang looks and performance naturally. It was developed by the English racing specialists Jomoro Ltd. design engineers, car preparation experts and former members of the Alan Mann Racing organization, and creation and production of the Microbe has been carried out with the same seriousness and dedication that would accompany a bid for a racing championship. Each car is hand-built with traditional British craftsmanship. At every point of construction, safety and quality of components have been the primary considerations. Design of the car virtually precludes upsetting, yet a roll bar has been provided. Drum brakes are standard. 24.5 m.p.h.–effected by reduction gearing based upon a mechanically governed engine speed of 3600 r.p.m. Welded and stove enamelled mild steel monocoque chassis unit. Glass reinforced plastic removable body sections. 148 c.c. four stroke side valve engine unit to design by Tecumseh Products Company. Power transmission by Chain & Sprocket. Chrome plated coil spring and oil filled hydraulic damper independent suspension. Rack and pinion steering in hardened steel. Independent cable operated front wheel drum brakes operated on single leading shoe principle. Adjustable throttle and brake pedal assembly. 8" dia. Cast aluminium road wheels 6.5" wide front and 9.5" wide rear. Full harness adjustable safety belts by Britax. Fully trimmed and padded cockpit. Leather covered L.72 aluminium steering wheel. Rear view mirrors chrome finished. Rear Wing on chrome plated supports. Choice of six standard colours–Red, Yellow, Blue, Green, White, Orange. Driver suits in five sizes and four standard colours_Red, Turquoise, Yellow, Green. Craftsman made black leather driving gloves. Patent and Design Registration filed in Great Britain, U.S.A. And and W. Germany. The chocolate coloured transit, with racing car on trailer in tow, swept into the paddock. Out sprang the yellow-overalled driver and his mechanic. The tailored tarpaulin was peeled off the car in a few deft movements and stay straps, attached to heavily chromed suspension links, were released. The GP duo rolled the bright red racing machine off the trailer with ease. 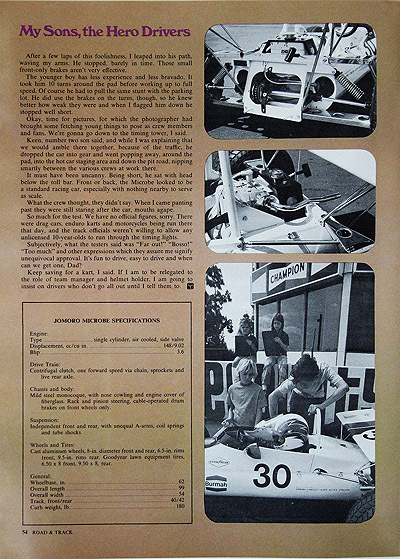 Pressures of the fat racing tyres were checked and the lightweight GRP engine compartment cover was removed to reveal a compact, speck-free power plant. Oil and fuel were added and the driver donned his green helmet and black driving gloves. He stepped in and was strapped securely into a Britax full racing harness. Outside, the mechanic had replaced the engine cover and was "firing-up". The engine caught and burst into healthy song. Dipping the throttle, the driver glanced to his left, selected first and accelerated away, the suns glare bouncing off the aerofoil. 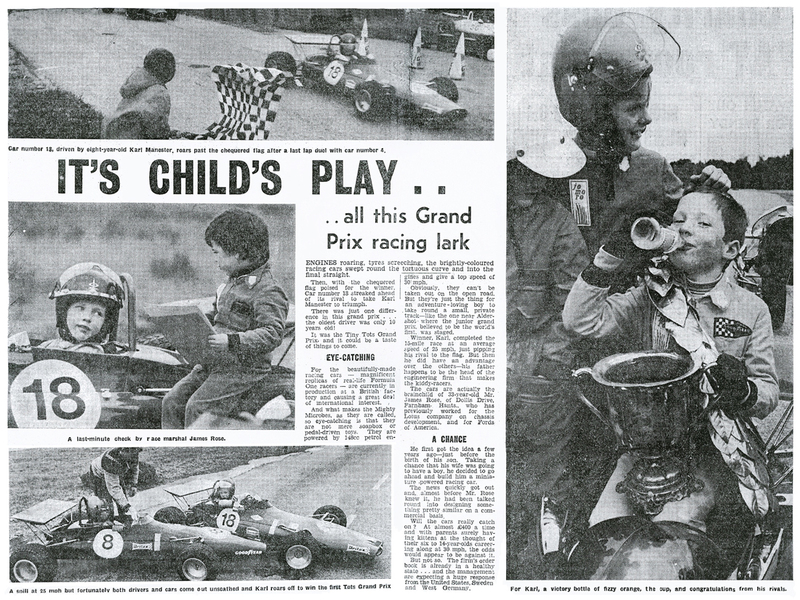 This is a regular occurrence on any race track, but in this instance, the driver aged seven and his mechanic, "dad". Furthermore, the red racer was no product of Maranello, but a pseudo racing car built to exacting standards and designed fro children from the age of six to a height limit of 5ft 3in. There have been mini racing cars for children before. But never a replica of a F1 car and none (in our experience) has matched the workmanship and design authenticity that exemplify this latest car, the Mighty Microbe. These superbly scaled replicas are the product of Jomoro Ltd, vehicle preparation specialists and design engineers of 10 Mill Lane Estate, Alton, Hants, and represent the combined expertise of the company's partners (all ex-Alan Mann Racing) and the culmination of a design and development programme which bore more association with the Grand Prix scene than that od a children's toy manufacturer. Jomoro has been formed just on a year and prior to this all three partners, R. J. Manester, 35, J. Rose, 33 and J. T. Morgan, 28, were involved deeply in the racing and competition car construction business. Up until the formation of the sales company they were responsible for many motor race achievements, not the least of which were the design, development and modification of the Les Blackburn 3 litre Capri, one of the most successful privately entered vehicles in long distance saloon car racing during 1970, and the construction and development for BLMC of the awe-inspiring Rover 4.2 in a much modified 2000 shell piloted by Roy Pierpoint. Such a background is pre-eminent in this, their latest project, and on a visit to the factory, we were much taken by the rigorous standards that are maintained, especially the all important emphasis which the company place on safety. The Mighty Microbe (a flea fed on Bio-Strath?) sells for £380 in simple kit form or £393 ex.pt. 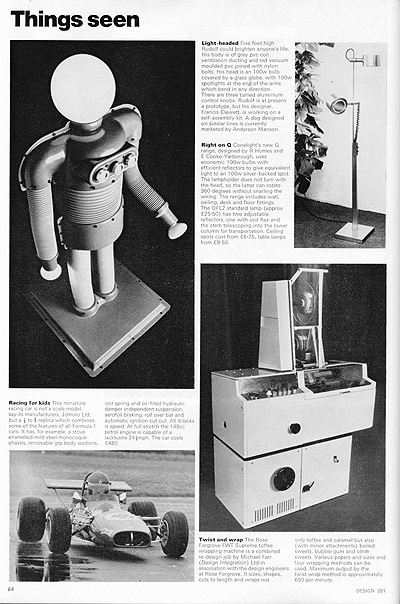 For a factory built and tested product – not a cheap "toy" but most of the components are hand made and those which are not come from "reputable specialist concerns". The design is fascinating: the chassis is a stove enamelled monocoque produced of 22 gauge mild steel and is clothed by removable GRP body sections in red, yellow, blue, green, black or white, complete with racing decals. The power plant is a rear-mounted, four-stroke, 148cc Italian Aspera lawnmower engine which produces 3.5 bhp at 3600 rpm and projects the car at a top speed (governed) of just under 30 mph. No gear changes are necessary because a centrifugal clutch is used and the engine can be revved at rest (producing a delightfully guttural exhaust note) thanks to the fitment of a neutral selector. The "grass-cutter" drive is taken by chain from the crank through to an axle-mounted sprocket and engagement shocks are cushioned by specially fabricated bushes before power is transferred to the hardened steel driveshafts which progress in harmony with irs, the top and lower links of which are attached by aluminium alloy uprights. The ride is damped by strut-type shock absorbers of Italian design, modified by Jomoro, and the coil springs are produced by Terrys. The front suspension arrangement is almost identical, the exception being the addition of pick-up points on each upright for the steering tie rods and cable-operated brakes. These retarders act on the inner edge of fat, 6.5in. Dia. Aluminium road wheels, equipped with chunky lawn-saver tyres by Goodyear. Rear wheel diameter is 9.5in. And here there are no brakes as the engine is said to exert sufficient stopping power. Maintenance poses no problems. All moving parts of the suspension are bushed and service-free, except for the provision of oil holes should the driver wish to assume lubrication responsibilities with the aid of an oil can. The engine merely requires ordinary lawnmower maintenance and the drive chain has to be lubricated (oil can, what else?) every 100 miles. To assist with the upkeep of a regular service schedule a mileage recorder is incorporated with a facia mounted speedometer. Fuel is carried in a two-pit capacity tank which is mounted away from impact and at a suitable distance from the driver. Consumption is a frugal 180mpg on 91 octane petrol. No lead acid batteries are required as the engine embodies a flywheel magneto and starting is by a recoil mechanism and choke, both of which are mounted outside the car for "dad" to operate. Should the driver encounter difficulties an ignition cut-out switch is mounted on the facia, F1 style. Adding even further authenticity to the design is the fitment of a roll-over hoop, but the cars we saw had hoops of insufficient size as the seven-year-old behind the wheel had his head protruding above it. However, a remedy would be extremely simple to effect and we understand that Jomoro are looking into the matter. Not that the company ever envisage a need for the hoop. 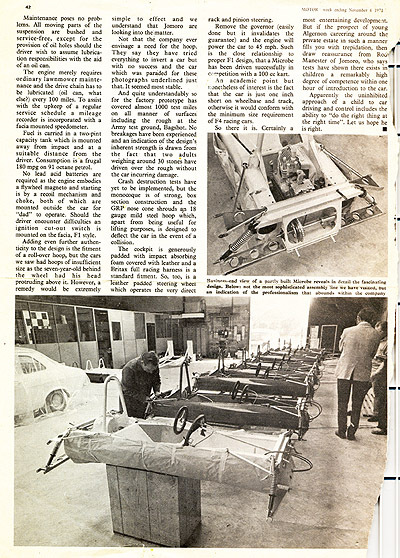 They say they have tried everything to invert a car but with no success and the car which was paraded for these photographs underlined just that. It seemed most stable. And quite understandably so for the factory prototype has covered almost 1000 test miles on all manner of surface including the rough at the Army test ground, Bagshot. No breakages have been experienced and an indication of the design's inherent strength is drawn from the fact that two adults weighing around 30 stones have driven over the rough without the car incurring damage. Crash destruction tests have yet to be implemented, but the monocoque is of strong, box section construction and the GRP nose cone shrouds an 18 gauge mild steel hoop which, apart from being useful for lifting purposes, is designed to deflect the car in the event of a collision. The cockpit is generously padded with impact absorbing foam covered with leather and a Britax full racing harness is a standard fitment. So, too, is a leather padded steering wheel which operates the very direct rack and pinion steering. Remove the governor (easily done but it invalidates the guarantee) and the engine will power the car to 45 mph. 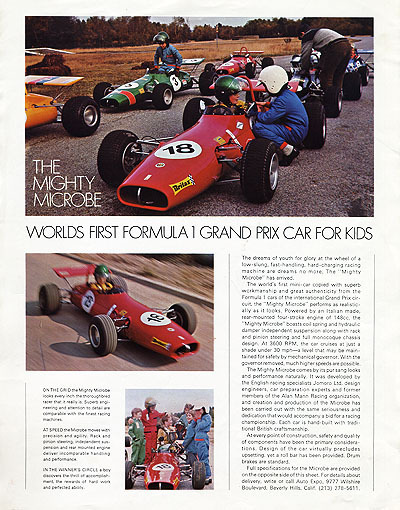 Such is the close relationship to proper F1 design, that a Microbe has been driven successfully in competition with a 100 cc kart. An academic point but nonetheless of interest is the fact that the car is just one inch short on wheelbase and track, otherwise it would conform with the minimum size requirement of F4 racing cars. So there it is. Certainly a most entertaining development. 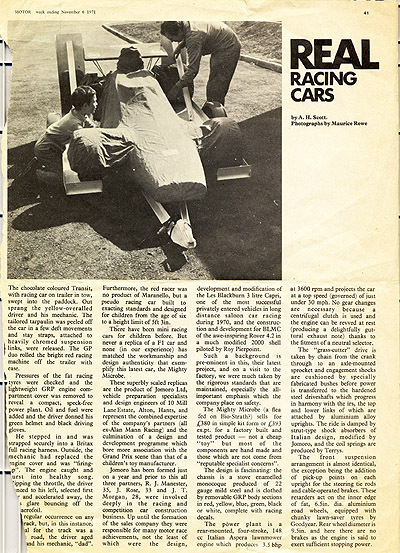 But if the prospect of young Algernon careering around the private estate in such a manner fills you with trepidation, then draw reassurance from Rod Manister of Jomoro, who says tests have shown there exists in children a remarkably high degree of competence within one hour of introduction to the car. Apparently the uninhibited approach of a child to car driving and control includes the ability to "do the right thing at the right time". Let us hope he is right. This miniature racing car is not a scale model, say it's manufacturers, Jomoro Ltd. But a half to two thirds replica which combines some of the features of all Formula 1 cars. It has, for example, a stove enamelled mild steel monocoque chassis, removable grp body sections, coil spring and oil-filled hydraulic damper independent suspension, areofoil braking, roll over bar and automatic ignition cut out. All it lacks is speed. At full stretch the 148cc petrol engine is capable of a lacklustre 24.5 mph. The car costs £480. Gas / Any low octane gasoline. 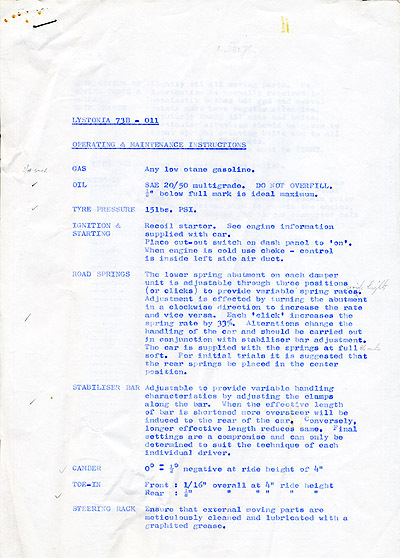 Oil / SAE 20/50 multigrade. DO NOT OVERFILL. 1/8" below full mark is ideal maximum. Tyre Pressure / 151bs. PSI. Ignition & Starting / Recoil starter. 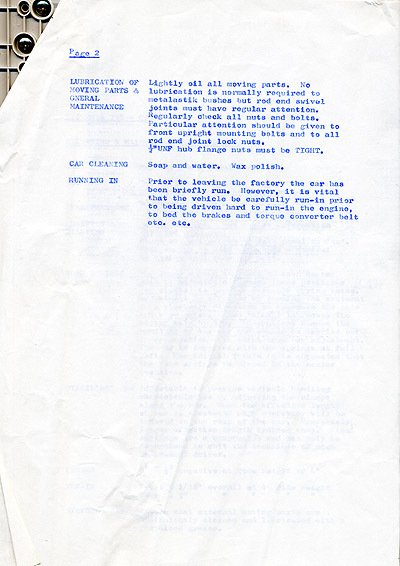 See engine information supplied with car. Place cut-out switch on dash panel to 'on'. When engine is cold use choke – control is inside left side air duct. Road Springs / The lower spring abutment on each damper unit is adjustable through three positions (or clicks) to provide variable spring rates. Adjustment is effected by turning the abutment in a clockwise direction to increase the rate and vice versa. Each 'click' increases the spring rate by 33%. Alterations change the handling of the car and should be carried out in conjunction with stabiliser bar adjustment. The car is supplied with the springs at full soft. For initial trials it is suggested that the rear springs be placed in the center position. Stabiliser Bar / Adjustable to provide variable handling characteristics by adjusting the clamps along the bar. When the effective length of bar is shortened more oversteer will be induced to the rear of the car. Conversely, longer effective length reduces same. Final settings are a compromise and can only be determined to suit the technique of each individual driver. Camber / 0 = half negative at ride height of 4"
Steering Rack / Ensure that external moving parts are meticulously cleaned and lubricated with a graphited grease. Lubrication of moving parts & general maintenance / Lightly oil all moving parts. No lubrication is normally required to metalastik bushes but rod end swivel joints must have regular attention. Regularly check all nuts and bolts. Particular attention should be given to front upright mounting bolts and to all rod end joint lock nuts. 1/2" UNF hub flange nuts must be TIGHT. Running in / Prior to leaving the factory the car has been briefly run. However, it is vital that the vehicle be carefully run-in prior to being driven hard to run-in the engine, to bed the brakes and torque converter belt etc. etc.